Filipino American Kare-Kare is such a treat. One must keep in mind that 250 g yields 600 calories. Knowledge about your intake can be easily incorporated into healthy lifestyle choices. 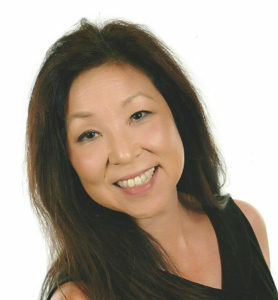 Valerie Matsunaga, is a retired pharmacist who has won awards in weightlifting: 2015 Olympics, Silver Medal in the Masters World Cup; 2017 World Masters Games, Silver Medal; and 2017 National Masters Weightlifting Championships, Bronze Medal. Filipino food has been described as a medley of Chinese, Malaysian, Spanish and American cuisine. This evolved as food was prepared by Malaysian settlers and infused with spices from Chinese settlers through commercial relations, taking place during the three hundred years of Spanish rule, and sprinkled with American influence. Any party is not complete without the following five traditional dishes. Let’s learn about the nutritional facts about our favorite food, and how the nutrients are incorporated into our meal planning. Originating from the northern regions of the Philippines. 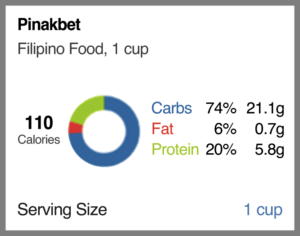 Pinakbet means “shrunk” or “shriveled” in Ilocano. Staples in this dish are vegetables like bitter melon (ampalaya), eggplant, tomato, okra, string beans, chili peppers, parda, beans, and others. Root vegetables often included. 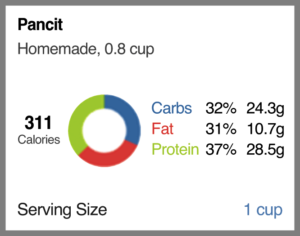 Various recipes will vary the nutritional content, here is a typical breakdown of a one cup serving according to MyFitnessPal. Adobo is a cooking method originating from mixed heritage where the meat is marinated and stewed. There are many regional varieties and most use vinegar, soy sauce, garlic, and black pepper. Filipino adobo is not to be confused with Spanish adobo, as they have very different flavors. Here is the content of a 3 oz. 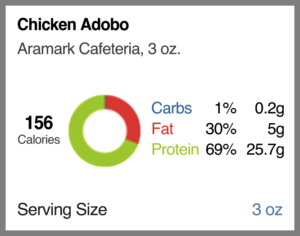 serving of chicken adobo, according to MyFitnessPal. This staple dish is made of rice noodles pan-fried with chicken, pork, shrimp, cabbage and carrots. 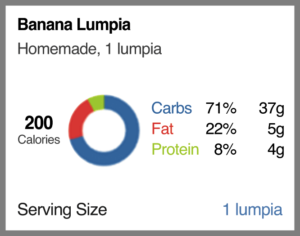 Lumpia, similar to spring rolls of Southeast Asia, are fried pastries that vary depending upon the version, containing banana, vegetables, or meats. 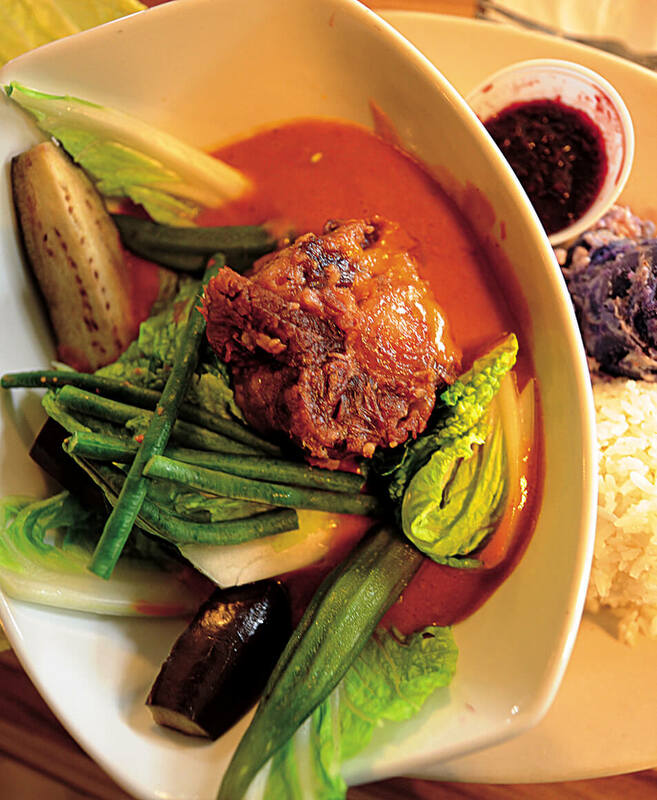 Any feast is not complete without Kare-Kare. It is a stew with a thick savory peanut sauce. 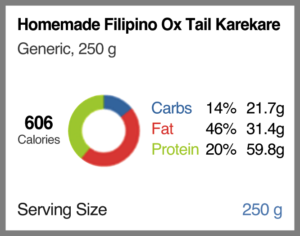 A typical Filipino American version exclusively uses oxtail, though other meats may be called for. Vegetables, such as eggplant, Chinese cabbage and greens, including root vegetables, such as daikon are added. Flavored with roasted peanuts or peanut butter, onions and garlic are used and this is thickened with rice. These five dishes are just a tip of the iceberg of Filipino cuisine. They can be easily incorporated in a healthy lifestyle with the additional knowledge of the carbohydrates, fat, and protein content of these dishes. The goals for a typical adult would be 40% carbs/40% protein/20% fat. 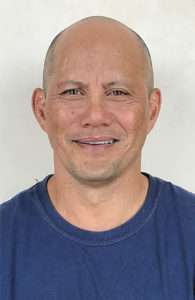 Vernon Patao is Maui born, island trained and public school educated at Lihikai Elementary, Maui High School, and the University of Hawai‘i at Mānoa. Before the Olympics he ranked three times as U.S. champion. As an Olympic weightlifter he won one gold, one silver and two bronze medals. Today he is a firefighter and an enthusiastic coach and teacher for many who seek to be healthy and fit, especially for those who go to his gym regularly. Filipino cuisine is widely popular on Maui with many options to choose from: Tante’s Island Cuisine, Bistro Manila Maui, CAA Market Place, or Paradise Supermart,…just to name a few. We connect with our culture and heritage through our food. It helps us retain a cultural identity of honoring where we have come from, honoring our roots and shaping where the future will lead us. Enjoy the traditional foods that we have grown up with and are accustomed to, also known as “comfort food” to nourish your body, mind and soul.